Wowzers! What a week! You can definitely tell that Spring Break is over and the race to the end of the school year is near! We haven't been home one night this week and I feel like I haven't seen Mike more than in passing in days! I'm looking forward to a weekend at home where I can relax catch up on all the laundry! :) How was your week? As I look back over this past week, one particular person stands out to me - our middlest, Holden. Last Friday she turned 10 and we spent a few days celebrating the big double digit birthday. She makes 4 out of my 5 FAVORITES this week! I think she's awesome but I'll let you decide for yourself. Here's my Friday FAVORITES! A couple of months ago, we were at the mall and Holden mentioned wanting to have her ears pierced. I didn't give it a second thought because this girl HATES needles. Have I ever told you it once took us 45 minutes to convince her to get the flu MIST?! Not the shot - the mist! And, yes, you read it right - FORTY FIVE MINUTES! Well, Holden proved me wrong and continued to want to get her ears pierced. She wanted to wait till her birthday and her dad had to come with us (she convinced him to take the entire day off from work "cause, dad, it's my BIRTHDAY!"). So, after lunch, the three of us went to the mall to get this girl's ears pierced! Here she is choosing her earrings - she chose her birthstone! Do you see the way she's clutching the arms of the chair?! This sweet girl was only making the mark on her ear with a marker! Still really anxious but very excited! This is one of FAVORITE pictures! Mike (with a Justice bag hanging from his arm) is checking the marks to make sure "baby girl" has earrings that are even! she got her ears pierced!!! So proud of this girl for facing her fears! Her new earrings are definitely her FAVORITE! 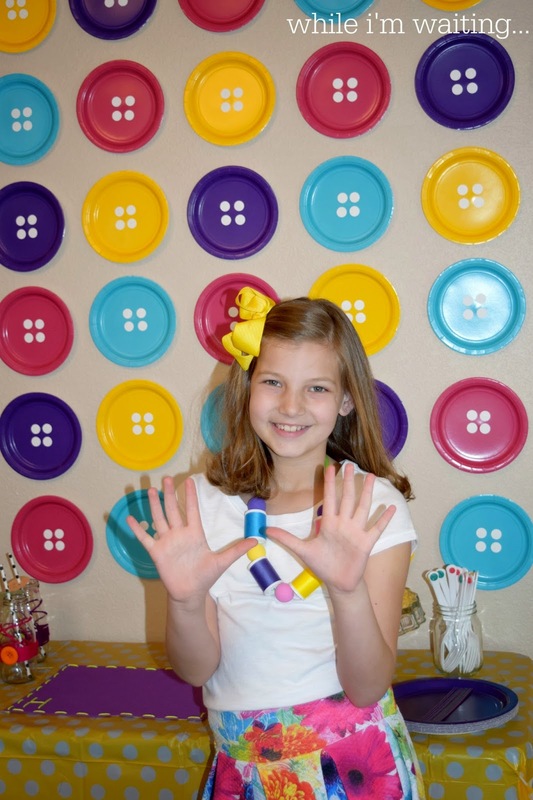 On Sunday, we celebrated her birthday with a few friends and had a sewing party. It was a lot of work but so worth it! You can read the whole recap here. This past Sunday would have been Kennedy's 16th birthday. There is just a huge void in our home that was once filled by the most amazing four-legged fur baby. I even miss vacuuming the endless balls of fur that would drift across our floors. A few weeks before Kennedy passed away, she had been wearing a little bandana. After she died, I took it off of her but couldn't bare to throw it away. Kennedy was very special to Holden and I wanted to be able to give Holden the bandana in a special way. Carrie at Mike's work makes beautiful quilts. I talked with her about what I wanted to do and she agreed to help me. Look what she created! See the turquoise pieces with owls on them? That's Kennedy's bandana woven into a quilt. I LOVED how it turned out! I surprised Holden with the quilt after school on Monday. I love how she is rubbing Kennedy's bandana. Holden doesn't like to get emotional in front of people and shortly after this picture, she asked if she could go to her room. She just needed a little time to think about Kennedy with no one watching. Later that evening when I went up to tell her goodnight, I could tell how much she loved the quilt. Her tender heart is my FAVORITE! You're learning lots about Holden this week! So far you know she's a brave 10 year old who is afraid of needles and has a tender heart. She's also an amazing little artist! Each week she goes to an after school art class. She's not fond of the art class at school because "mom, it's not really art - you have to do things exactly like the teacher says". She recently went to the symphony and they are having an art contest. They asked the students to submit works that shows what the symphony made them think about. Apparently the sound of instruments reminds Holden of birds singing! So sweet! I love the concept of mystery boxes and I love to purchase with a purpose (to check out some of my recent goodies go here, here, or here!). Some of you might be wondering - exactly what does it mean to purchase with a purpose. I love to shop and what better way than my purchases helping someone else. I appreciate artisans who can make beautiful things with their hands and I love supporting businesses that appreciate these things too. A company I've recently found and have completely fallen in love with is Sevenly. What is Sevenly? Watch this quick video to learn more. I've been following Sevenly on Instagram and learned they were about to release their second CauseBox. For less than $50 each quarter, you receive a box filled with over $150 worth of socially conscious products. And, they give you a list of charities and you get to choose where your $7 donation goes to. I love everything about this! Wednesday of this week I was happy to see this little blue box sitting on my front porch. I couldn't wait to open it to see what was inside!!! I knew it was good from the start when the sticker said, "people matter". Earlier this week I mentioned that I am waiting on a food pantry to get up and running at my son's middle school. We love volunteering at our local food bank and fighting food insecurity in our community is very important to us. I have had this on my heart for a long time. Imagine my surprise when every item in this box was chosen for their bold stand against global hunger and malnourishment! This necklace was my absolute FAVORITE item!!! It's from Half United and is the "Fighting Hunger" necklace. It incorporates three hand-polished recycled bullet casings to take a strong stance in the fight against hunger. HALF of their profits from every product sold is donated to global hunger relief efforts! Companies that give back are my FAVORITE!!! *Tribe Alive bracelet (see below for a better picture) - every bracelet is handmade by women in Honduras under fair trade working conditions, and each piece contributes to community development and job creation in developing countries. *Good Spread peanut butter & honey packet - "It's for people looking for a healthy snack with a healthy cause." To sign up for Sevenly's CauseBox, you can click here. We are having glorious weather here in Texas. I hope your weekend is full of sunshine and all your FAVORITE things! Thanks for stopping by! That little girl is a precious gift. I know how you feel about your dog. I'm grateful I still have Franklin. All the others have had to leave to go to Heaven. The causebox is way cool. Thanks, Janie! I think she's pretty special too! :) Thanks for stopping by and I hope you have a wonderful weekend! Ahhh earrings!! So cute and fun! I missed the birthday party post so ill have to check that out! Have to check out sevenly too- have a great weekend! Isn't it crazy?! She has done such a fantastic job of cleaning them multiple times a day and also turning them. She doesn't like anyone to mess with her so I'm super happy that it's all worked out. Can't believe she's getting so big! You'll have to let me know what you think about her birthday party. Lots of prep work but SEW worth it. :) Definitely check out Sevenly - I think you'll love it too! Happy Saturday! Hope you have a wonderful day! Thanks for stopping by! I Am IN LOVE With that Quilt!! Thanks, Tara! Me too! I had no idea how it was going to turn out so you can imagine my surprise when I receive it! Such a treasure! Thanks for stopping by! Have a great day! Holden's painting is amazing! What talent God has gifted her with! I know she will use to do incredible things! Thank you, Sara! I can't wait to see how she continues to use her gifts! She's so cool! Wow! You had me tearing up with that quilt story. Holden is one lucky girl to have you as a mama! 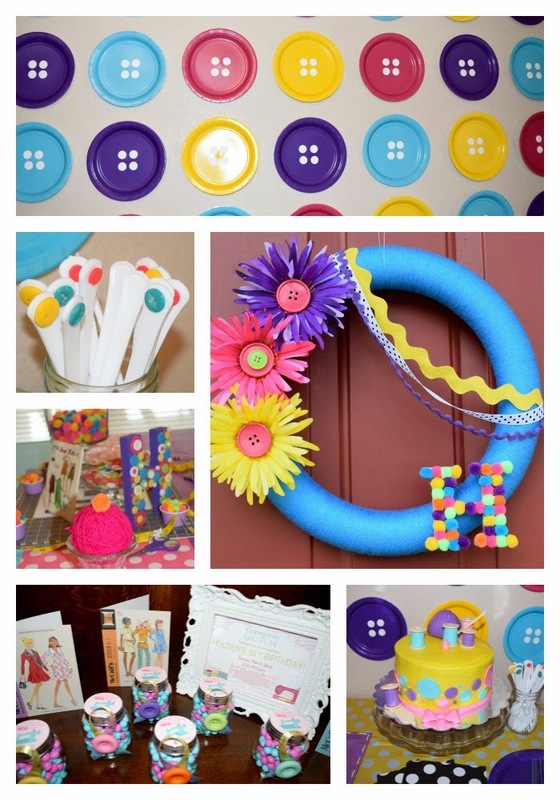 Your sewing party decorations are so cute! What a good idea. Ah, thank you, Katie! Your words were so sweet!!! The sewing party was fun! Holden had SEW much fun! ;) Thanks for stopping by! 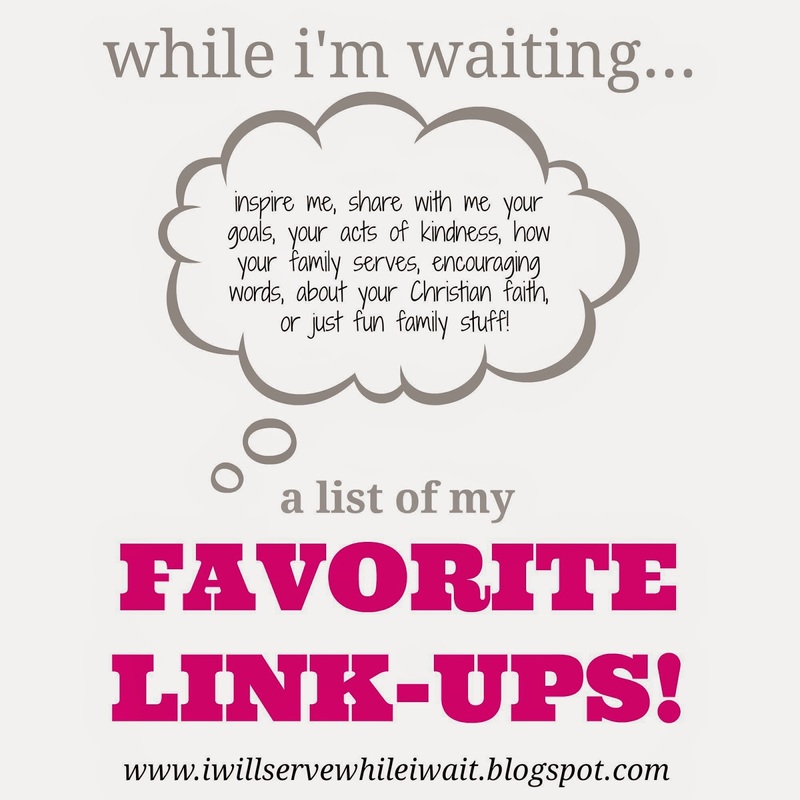 Hope to see you Wednesday at the linkup!